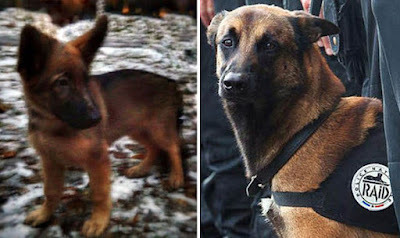 The brave seven-year-old Police dog died instantly during the Paris siege in Saint-Denis when a Muslim suicide bomber exploded as French counter-terrorism police stormed the terrorists’ lair. Now Alsatian puppy Dobrynya will replace Diesel as a gift and expression of Russia’s solidarity with France. Mr Kolokoltsev said the puppy ”will be able to occupy the place in service of the police dog Diesel killed during a special operation to neutralise terrorists."